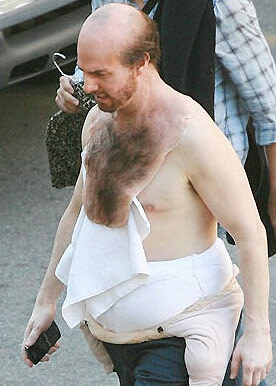 There was a photo that was online late last year of Tom Cruise bald and wearing a fat suit. The NY Times reports today that it’s from an uncredited cameo in the upcoming Ben Stiller comedy “Tropic Thunder” also starring Robert Downey Jr., Jack Black, Matthew McConaughey and Nick Nolte. They wanted to keep Cruise’s appearance a secret, but the news got out at an industry screening of the film, put out by Paramount Pictures. At an industry screening Tuesday night of the forthcoming comedy “Tropic Thunder” from Paramount Pictures and its unit DreamWorks, Tom Cruise brought down the house with his surprise portrayal of a bald, hairy-chested, foulmouthed, dirty-dancing movie mogul of the kind who is only too happy to throw an actor to the wolves when his popularity cools. The several hundred Hollywood agents, managers, publicists and reporters at the screening on the Paramount lot here couldn’t have missed the joke. In August 2006 Mr. Cruise — after spending many years at Paramount and appearing in some of its biggest hits, including “Top Gun” and the “Mission: Impossible” series — was sent packing by Mr. Redstone, the chairman of Viacom, the studio’s parent. Two years later Mr. Cruise is back in a Paramount movie, playing a craggy ingrate in what is shaping up as one of the studio’s best prospects for the summer. The movie, a raunchfest directed by Ben Stiller, about a bunch of actors whose jungle war movie turns unexpectedly real, also stars Mr. Stiller, Robert Downey Jr., Jack Black, Matthew McConaughey and Nick Nolte. The humor may have been heightened by knowledge that Mr. Cruise and Mr. Redstone only last week kissed and made up over a very public lunch at the Beverly Hills Hotel. He doesn't have one ounce of muscle tone. Dammit! I really wanted to see that movie too until I heard TC was in this. Oh well. Wow who knew Tiny was capable of humor? Are the $cienos afraid of the sun? They all have a sickly white/gray color to them with no muscle tone. I don't care how "funny" his scene is in the movie, if he's attached, I'm not buying. When I first saw it I thought it was BEFORE his daily makeup, hair, Spanx, and platforms application. Why would Paramount hire Tofu Tom to mock the head of their own company? It makes no sense. Did I read it wrong? I don't see any movie Tom is attached to either, he skeeves me out. Check out his part and the lack of hair in it. Hope he doesn't go to the same stylist Travolta did for his spray on. I agree I won't pay to see or even watch anymore anything Mr FancyPants is in. He went too far. All those vitamins and he's that pasty? Keith Urban Mocks Tom Cruise?